This November, dare to venture where no hero in the Marvel Universe has ever gone before as the Guardians of the Galaxy find themselves stranded on the home world of the Symbiotes! It all kicks off this November in Planet of the Symbiotes, the newest storyline beginning in Guardians of the Galaxy #21, from blockbuster writer Brian Michael Bendis and Marvel All-New Young Gun artist Valerio Schiti! 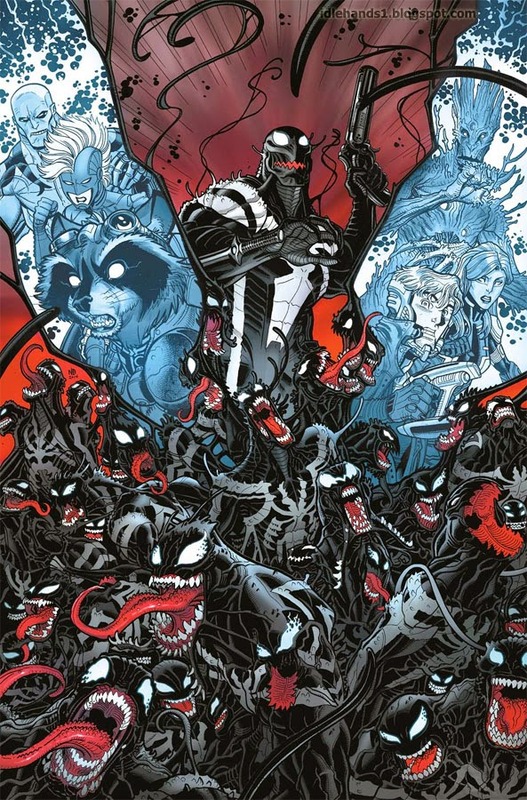 Ever since the Symbiote bonded with Flash Thompson, he has wielded it as a force for good, making the Earth a safer place as the hero known as Venom. Only the far reaches of space are a little bit out of his depth – even when he’s packing a crazed alien costume! With the Venom Symbiote back among its own species, where will it’s allegiances lie? Trapped on a world full of hostile alien parasites, the Guardians of the Galaxy might begin to regret letting Flash Thompson join their team! Finally reunited once more, will the Guardians of the Galaxy’s first mission back together be their last? Find out this November, as the team are put to the test on a planet of carnivorous aliens in Guardians of the Galaxy #21 – the first issue of Planet of the Symbiotes!